Many years ago my family and I had a contractor install a water feature on our property. 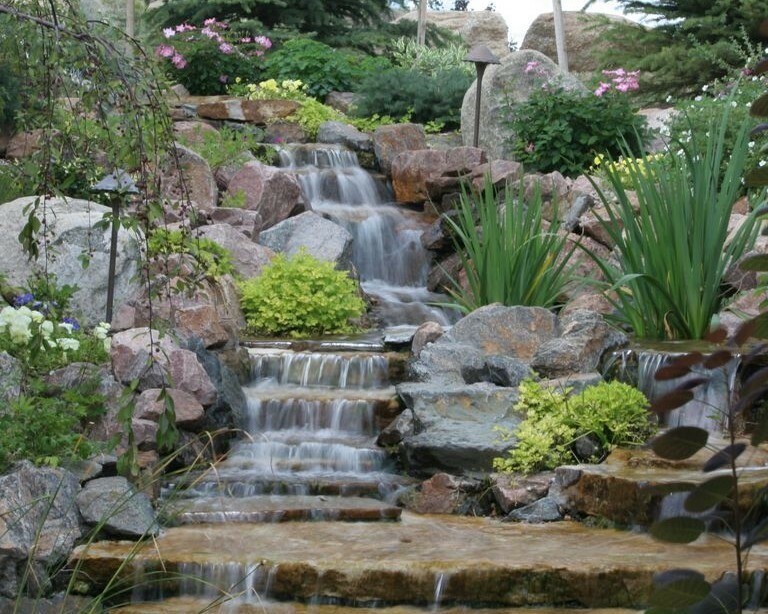 Today, water pumps through an underground pipe up a naturally sloped ridge, aggregating in an upper pool, then cascades over rocks into a 6’ x 40’ naturally landscaped river. The river divides into two separate streams, both of which empty into a 2,600-gallon lower pond. Our golden retriever, Riley, became fascinated with the pond and its fish, and one day we realized he had been digging through the rubber underlayment beneath the river rock. The water feature began leaking and has since required extra water to be regularly added. The contractor came out on a consultative assessment; after $1,500 he assured me it was fixed. It still leaks every day. What I know is the large pond below holds water because its level remains constant, but there are leaks somewhere in the rivers feeding the main pond below. There are thousands of rocks – large, medium and small – that line the rivers leading to the falls that serve the pond. How can the source of the leakage be identified and remedied? Does one preemptively remove ALL the rocks and replace the entire underlayment to be certain any leakage is sustainably prevented, or incrementally check and patch small segments to see if that stems the water loss? Health systems have acquired physician practices, ostensibly to “lock in” referral networks before their competitors did so and to make certain their provider network and geographic coverage was attractive to payers. However, experience has demonstrated that physician referral patterns did not change simply because their paycheck came from ACME hospital instead of ABC practice. MGMA reports the average hospital loses $200k per employed physician, per year. For an average hospital employing 125 providers, this represents an annual loss of approximately $25 million. Even when using a narrow definition for network leakage – the proportion of patient cases that are referred from employed providers to competitive specialists, diagnostic centers or other facilities, excluding those referrals that do so based on patient preference, lack of clinical coverage or geography – research indicates it can amount to 25-35 percent of patient cases and as much as $40 million in lost revenue per year. By utilizing a common electronic repository for all demand – physician referrals, orders and patient transfers between facilities – health systems can utilize basic analytics to gain clear visibility to empirical data on referral patterns. This data can become a useful tool to engage providers in conversations regarding the most appropriate utilization and referral decisions for patients.